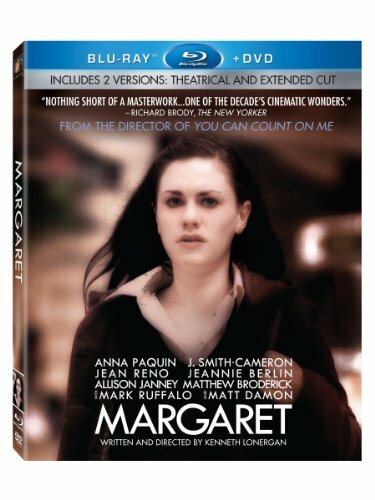 Twentieth Century Fox Home Entertainment today announced that Margaret , the long awaited follow up to two-time Academy Award(R) nominee Kenneth Lonergan's critically acclaimed debut feature You Can Count on Me, will release on Blu-ray combo pack July 10. Available exclusively at Amazon for a limited time, the two-disc Blu-ray set includes the theatrical version as well as a bonus DVD featuring the never-before-seen extended cut. Hailed as "one of the decade's cinematic wonders" (Richard Brody, The New Yorker) and named "one of the best films of the year" (Roger Ebert, Chicago Sun-Times), Margaret is "ambitious, affecting, unwieldy and haunting" (Ann Hornaday, Washington Post) and features complex performances from a powerhouse cast including Anna Paquin, as the film's eponymous heroine (TV's "True Blood"), Mark Ruffalo (The Kids are Alright), Matt Damon (We Bought a Zoo, Invictus), and Matthew Broderick (Wonderful World). Synopsis: From Academy Award(R) nominated* writer/director Kenneth Lonergan (You Can Count On Me) comes a stirring drama Rolling Stone calls "a film of rare beauty and shocking gravity." Anna Paquin, Matt Damon and Mark Ruffalo lead a celebrated cast in the story of a Manhattan teenager whose life is profoundly altered after witnessing a terrible accident. Experience an emotional teen's extraordinary journey to set things right as her innocent ideals come crashing against the harsh realities of the adult world. It's an "extraordinarily ambitious film," raves Time Magazine.